Summer vacations 2010, I decided to explore a part of Delhi which probably not many of us would be well aware of. The locality of Nawada is situated right in between Uttam Nagar West Metro Station and Dwarka Mod station. A curious new kid in the city, the place did not really fascinate me much; in fact, it had a more of rural North Indian feeling than a cosmopolitan national capital. Tiny concrete huts, dusty roads and dry playgrounds; that would probably the geography of the place. There was nothing in particular in that place which I could connect to, considering that fact that I came from a place, which is lush green, usually rainy and surely not extremely hot. As I walked through the tiny lanes in the soaring heat of Delhi, I heard screams and laughs of kids from a distance. As I moved closer, I came across this bunch of kids enjoying their vacations with something that instantly made me nostalgic. This was something that I could connect to, something which I can easily connect to. There is this small village in Assam called Merkuchi, some 80kms west of Guwahati and 3kms south of the Bhutan border. The location probably is self explanatory as to how remote this place is. The biggest festival that is celebrated in this village is ‘Rongali Bihu’, a festival Assam is known for. Every year, there is a three day fair in Merkuchi to celebrate this Bihu and as a part of this fair, numerous sporting activities are organized, as means of connecting people and to celebrate the onset of the new year. It was here that I first came across Kabaddi, probably the national game of rural India. It was so fascinating for me to see teams lining up from far off villages for a game of Kabaddi. Sixteen years down the line, as I moved to Delhi, in one of the remotest part of the city, I found something which instantly connected to my experience of rural Assam; kids playing a serious game of Kabaddi. It was hot, it was dry, and the terrain was rocky. Yet, kids from Nawada, very dedicatedly and enthusiastically engaged themselves in the game. As the cliché saying goes, the real India resides in its villages, and there I was with a game, that connected a village in an urban north Indian setting with one in the remotest of the North East. However, for most of us, Kabaddi never really was a professional game. It was a game which we knew because of its cultural proximity. Also at the same time, for someone living in a urban setting it was really difficult for them to associate the game Kabaddi as a part of the popular culture. It was rare when the game was played, and rarely did anyone talk about it. Today as I browse though the micro blogging site Twitter, there is an active thread, #ProKabaddi. The micro blogging janta is talking about this recent booming phenomenon where in a game, which roots its origins in the ‘Gaon ki Chaupal’ have made its entry into posh indoor stadiums of cities. The onset of the Pro Kabaddi League has not just redefined the cultural game of Kabaddi into a professional game, but also expanded the audience horizon from just enthusiastic village crowd to urban sports fanatics and to cosy TV audiences. How do you view this evolution? Did anyone of us trace this phenomenal transformation process of the game? Or can anyone of us at least talk about the link which probably can be co-related to the raise of the game in the popular discourse? For me, it was the picture below. 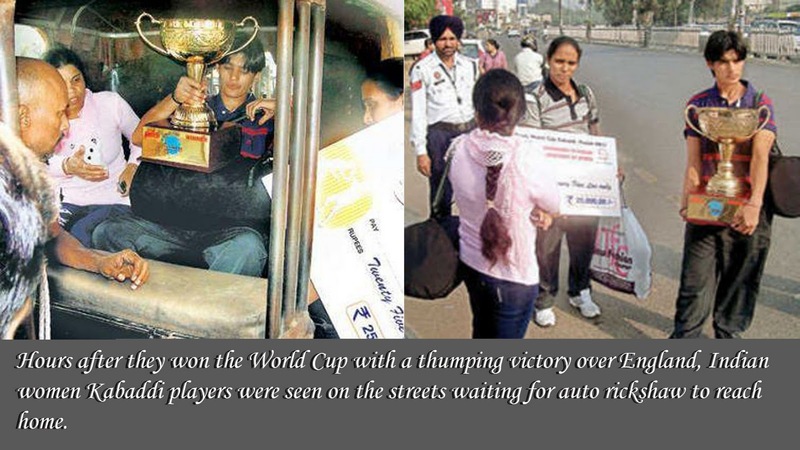 The picture of the Indian Women Kabaddi Team waiting for an auto after winning the World Cup beating England in the finals. This picture made me realize the plight of Kabaddi as a professional sport. And I feel, this picture probably bridged the gap of Kabaddi from just a rural setting to the urban setting. The game was always in our hearts. Kabaddi was in cultural sphere was immensely popular amongst certain group. Just as that it was not properly curetted to be a part of the popular culture. The Pro Kabaddi league is probably the first step in this long process of reintroduction of game in the popular discourse. Marketing, celebrity and finance are the perfect catalysts here. Today, you might not know the game, you might not know the names of the players, but you know what the phenomenon called Pro Kabaddi League is. Go out, support your team. As the Delhi franchise of the League Dabang Delhi calls it, let’s make Kabaddi the national Ru-Urban Sport of the country.